Author Written by Bubai and last updated on Posted on December 17, 2017 . In this tutorial, we will discuss SAP Reconciliation Ledger functionality and how it helps to synchronize FI and CO postings in real time. 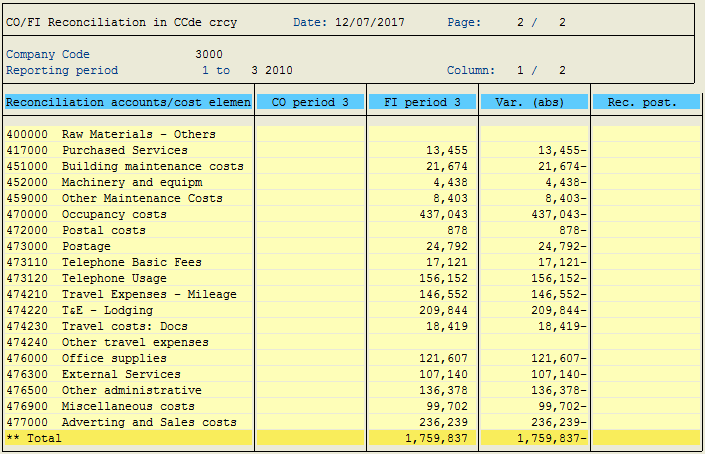 The essence of SAP Reconciliation Ledger comes into being when FI postings take place using cost objects. In situations where lot of subsequent postings take place within CO and are different from the initial postings that took place in FI, it is required to use SAP Reconciliation Ledger functionality, so that all the necessary cost objects gets automatically updated in FI postings and therefore FI and CO modules are synchronized in real time. Let’s consider a scenario of a FI posting where expense postings is done to a cost center. Now, to drill back and check in which Cost Object (Cost Center) the entry has been posted, we require SAP Reconciliation Ledger functionality. Specially in situations like in cross-company code / business area / functional area entry postings occur in CO area in a form of assessment / distribution, it is ideally required to have FI and CO reconciled. 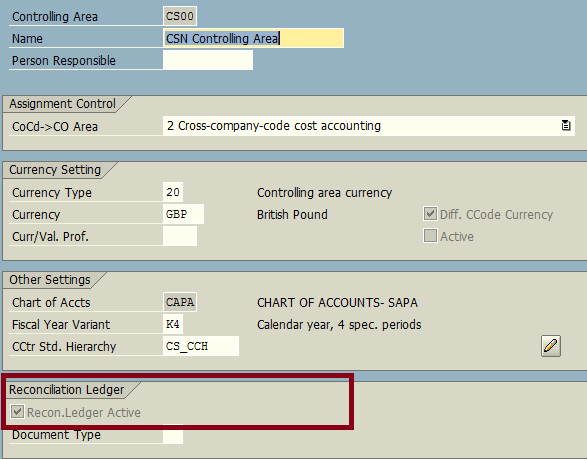 SAP Reconciliation Ledger facilitates updating of CO online. It is necessary to activate Reconciliation Ledger at the beginning of a new posting period therefore ensuring availability of data within the ledger during that posting period. Besides that, if required, it is better to repost all the necessary items belonging to the previous period. Select your Controlling Area and execute the transaction. Once successfully activated system display the confirmation message. In General Controlling settings, we can also see the indication that SAP Reconciliation Ledger is active. Now, let’s go through a scenario where CO internal settlement is initiated without any FI update. In a cross-company code scenario where two company codes CSN1 and CSN2 have internal orders IO01 and IO02 respectively. Initial transaction posting of expense booking for $1200 to the internal order IO01 is done in the company code CSN1, and later the amount of 1200$ is credited from the internal order IO01 and debited to the internal order IO02 during order settlement run. But the balance at both company code levels remains the same as prior to the settlement run. So, this situation is an example of CO internal settlement without any update in FI. Now, to make those associated company code (CSN1, CSN2) balances in line with the order settlement in CO, we need to run FI-CO reconciliation postings. We will credit from the company code CSN1 for $1200 and debit the company code CSN2 for $1200. As an effect of the reconciliation posting run, the internal CO activity will be accounted in FI balancing both company codes CSN1 and CSN2. This is the essence of SAP Reconciliation Ledger functionality. SAP provides standard transaction code FAGLCORC which displays report containing a list of accounts which require reconciliation in cross company code postings. Transaction code S_ALR_87013603 displays a complete list of CO/FI reconciliation accounts for a particular period showing the difference between to associated ledgers. At a later stage, a separate transaction code KALC is used to carry out all reconciliation ledger postings related to FI/ CO. In situation where the new G/L is not active, SAP Reconciliation Ledger activation is essential because it helps to update/synchronize both FI and CO in real time. In ECC 6, all scenarios are associated with the new G/L activation. It means that the real-time integration of controlling with financial accounting is implemented for reconciliation. SAP Reconciliation Ledger is used in situations like cross-company code, cross-business area and cross-functional area posting entries take place within a controlling area which are also relevant to FI. In classic R/3, SAP Reconciliation Ledger plays an important role in synchronizing CO posting with FI by creating reconciliation postings. 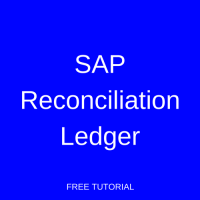 Let us review the functions of SAP Reconciliation Ledger. With the help of Reconciliation Ledger, we can check the report containing CO > FI account reconciliation. It helps in identification and display of data flows within controlling across company codes and functional areas. Using SAP Reconciliation Ledger, we can also summarize postings because it replicates the data flow within controlling impacting the organization’s financial statement. Users have the liberty to choose reconciliation postings based on the reporting values or system can initiate automatic reconciliation postings depending on the situation. Reconciliation Ledger postings also provides report containing overview of all costs incurred which is very effective for cost analysis. For example, we can refer to items in Profit & Loss account from a Financial Statement which can be checked against the reconciliation report with respect to the relevant costs. In addition, we can also conclude the fact that reports on other components within a controlling area can also be extracted from the reconciliation ledger reports. Cannot create Profit & Loss accounting using cost of sales accounting. Not applicable for cross-application scenarios, evaluations in cross-company code/functional area postings. Please note that in order to update all CO related postings within SAP Reconciliation Ledger it is required to get Reconciliation Ledger activated. Before activation all automatic re-postings related to previous periods are generally ignored. So, in case we need to consider all fiscal year for re-posting, then we need to proceed with manual re-posting for each period. Did you like this tutorial? Have any questions or comments? We would love to hear your feedback in the comments section below. It’d be a big help for us, and hopefully it’s something we can address for you in improvement of our free SAP CO tutorials. The reconciliation account was created incorrectly and therefore only an FI entry was created and no CO entry. This has been shown up on the report S_ALR_87013603, but when i run the transaction KALC, no postings are done. I tried using transaction KE21N but the difference is not going away. Any help will be appreciated.